If for some insane reason you haven't played Star Wars: Knights of the Old Republic , hopefully its recent 50% price drop to $4.99 is enough to get you to solve that grievous error in your life. I mean, if I've learned anything from The Butterfly Effect, it's that one small mistake like this can lead to potential heinous consequences in the future. We effortlessly gave it five stars in our review, with most of the "issues" (Using some massive air quotes there!) just stem from the game itself just being on the old side. There's no Retina assets, for instance, because KOTOR comes from an era where a game running at 2048x1152 was something reserved for science fiction novels. KOTOR features a morality system that hinges on both the light and dark side of the force, allowing for two surprisingly different play throughs of the game where your actions revolve around good (or evil) things with force powers that follow suit. This not only changes the outcome of the story and the party members you get, but also how you approach battles as the dark side of the force grants access to offensive abilities like force lightning while the light side gives you healing powers. 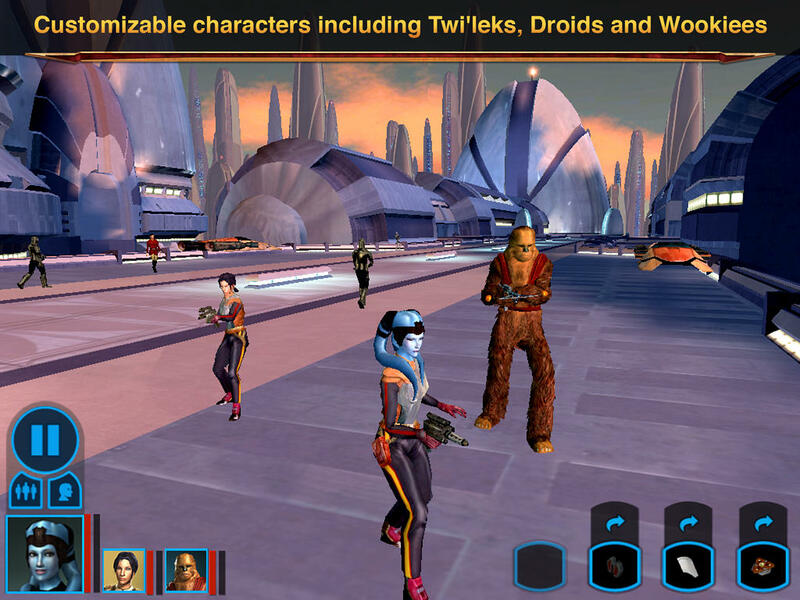 Seriously, get this game, or, if you know someone with an iPad who hasn't played KOTOR be sure to tell them. The single player campaign will take you ~30 hours, and if you play through it twice to see both the light and dark side of things, you're looking at paying just over 8¢ an hour for some of the finest Star Wars RPG action to ever grace your iPad.